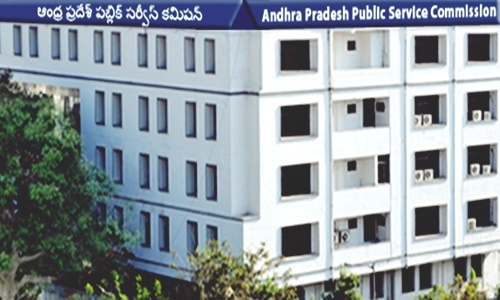 Andhra Pradesh public service commission has finally announced Recruitment notification for APPSC Group 3 Notification 2018 i.e Panchayat secretary (grade – iv) in a.p. panchayat raj subordinate service. Applications are invited through Online for recruitment to the post of Panchayat Secretary (Grade – IV) in A.P. Panchayat Raj Subordinate Service.the detailed notification will be releasing on 21-12-2018. Here we are providing the complete information regarding Notification release date, eligibility, selection procedure, exam pattern and syllabus for the candidates who are preparing for Group 3 (Panchayat Secretary) Examination. The objective type question papers are to be answered on computer system. Instructions regarding this computer based recruitment test are detailed in the Annexure – III. MOCK TEST facility would be provided to the applicants to acquaint themselves with the computer based recruitment test. Applicant shall visit the website and practice the answering pattern under MOCK TEST option available on main page of website www.psc.ap.gov.in or http://appscapplications17.apspsc.gov.in. Sl. No Name of the Post Vacancies Age as on 01/07/2016 Min. Max. Scale of Pay Rs. No person shall be eligible for direct recruitment if he/she is less than 18 years of age and if he/she is more than 42 years of age as on 01/12/2018. • At the payment Gateway the candidate has to give his/her Basic Personal Details such as Name of the candidate, Date of Birth, Gender, whether the candidate belongs to Andhra Pradesh State, community, Mobile Number etc. Candidate should enter his/her particulars i.e. Name, Father Name, Mother Name & Date of Birth as per his/her Secondary Education Board Class X Certificate. On receipt of fee at Payment Gateway, the candidate will be issued a “Journal Number” with which he / she can proceed with submission of Application online. Issue of Journal Number does not mean that the candidate has completed the submission of application online. It is only a confirmation of the fee received. • Un-employed youth in the age group of 18 to 42* years as per G.O.Ms.No.439, G.A. (Ser.A) Dept., dated: 18/10/1996 should submit declaration at an appropriate time to the Commission. • Applicants belonging to the categories mentioned above (except Physically Handicapped Persons & Ex-Service Men) hailing from other States are not entitled for exemption from payment of fee and not entitled for claiming any kind of reservation. Failure to pay the examination fee and application fee (in non – exempt case) will entail total rejection of application. The reason is, sometimes you may not understand the faculty because of fluency, voice or any other disturbance. At that time you cannot ask him to repeat the class. Or it may be tedious to write the running notes of him. So it’s better to have an online training class. With this Online training Classes you can hear the class at anytime, anywhere and pause and repeat the class whenever you want. Now the question is where you can get Online Coaching. 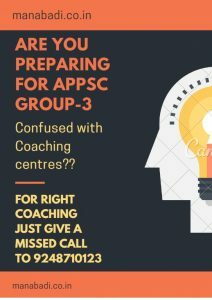 We suggest you to go Manabadi APPSC Group 3 coaching. It is the best APPSC Group 3 online coaching in this Online coaching you can view video classes through internet. Even if you don’t have internet you can view videos through pendrive. The pendrive can be attached to your mobile. Plz…extend the panchayathiraj payment and online application submission date..bcz ,there are many people waiting for apply to this job.i hope to underatand our posistion and try to exstand minimum 3 to 5 days ..thaking u sir/madam. Sir iam applied Panchayat secretary .but mistake name .please tell me sir Correction date. Sir i tried to pay the fee for group3 but it faild is there extention to payment?please give the extention for payment also. Sir i have paid money for group3 but i couldnot submit spplication whst can i do sir,how can get bavk my money?will they extend the date?sir please extend the date. ANY EXTENSION IN DATE TO APPLY GROUP3 ? sir iam waiting for free material, and model papers, please send me my email address . I have a paid fee of 250 and received journal number. But when I am trying to Submit Application it is giving error : Journal Number/DOB/DOP is wrong and not allowing me to submit application. I am giving all the details correctly. Please suggest, How to submit application or are there any persons facing the same problem with me. my name is anjineyulu, sc candidate.. i born in medak district. I studied one to eight class in medak district, sadasiva peta village. My native place is anantapuram district, further studies complete in anantapuram. now am applying group 3 but there is not acepte me for sc candidate its show oc candidate.. what can i do. i pay for fees rs .250. sir plz give me clarification immidiately.